Tuesday June 7 1910 Will went over to the voting place to be gone all day. I washed and cleaned of the house before noon. I got a letter from Lorna Mason about her Mother coming out and a card from Lizzie. I wrote here. I picked strawberries in afternoon. Art Jones helped with chores. Will came home to leave the horse but went back again. I was tired and went to bed early Wednesday June 8 1910 I ironed and baked bread. Will did not get home till nearly two oclock. He slept part of the afternoon I slept awhile and did the mending. I picked berries after supper. Weather cool. Marjorie [Horlaich?] down home. 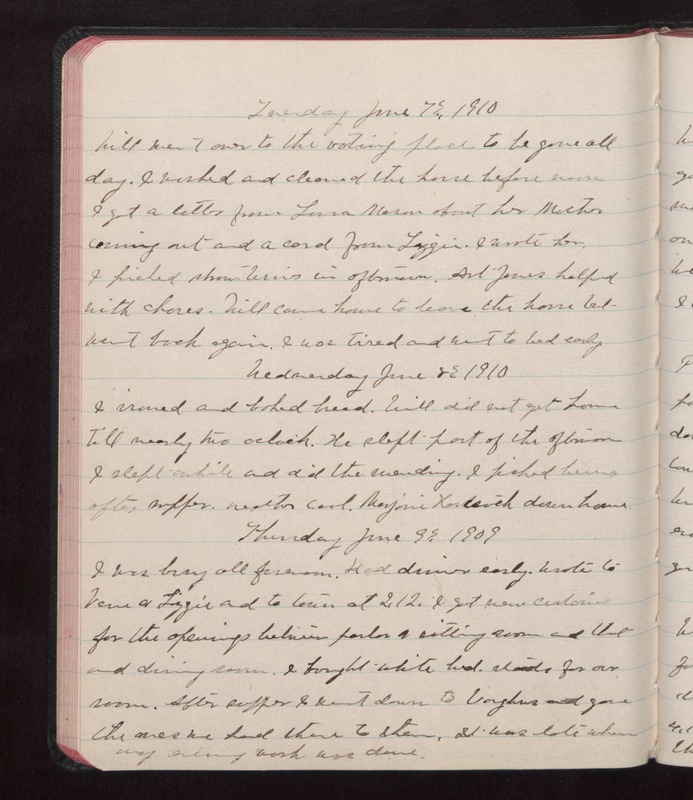 Thursday June 9 1909 I was busy all forenoon. Had dinner early. Wrote to Vera & Lizzie and to town at 2.12. I got new curtains for the openings behind parlor & sitting room and that and dining room. I bought white [illegible] [stools?] for our room. After supper I went down to [Vaughns?] and gave the ones we had there to them. It was late when my evening work was done.